What is your favorite track on OCEANO? Also released in Japan as Polydor POCP-7164 with a bonus track. Both issues appear to be out of print at the time of this post. 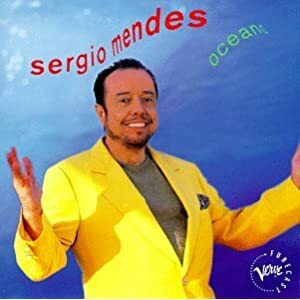 After his critical success with BRASILIERO, Sergio joined up with Polygram/Verve to release this album. ©1996 PolyGram do Brasil Ltda. All rights reserved. And the third song, "Holografico Olodum," is another one of my late-era favorites. It's got this quirky beat and the chorus is one of the most catchy things Sergio ever did. You get it in your head and you're humming it all day. Apparently I'm not the only one who loves this track since it showed up on the new Celebration set. Oceano was the third of the troika of albums I bought in the used store one day as I played catch-up. This copy was probably some kind of cut-out or promotional giveaway as it's got a rectangle cut out of the first page of the booklet. So, where Sergio's breast pockets would be, instead you can see part of the lyrics showing through, and the cut-out edges look like the work of an Exacto-knife®. It was the only copy this used shop had - or ever had to my knowledge (I never saw another one), so I bought it, figuring that it would sound just as good. When I discovered that I like the album a good deal, and that the Japanese version had an extra bonus track, I sprang for one of those, so at least I have one with complete artwork (and the Japanese version has one of their fold-out black & white inserts with the notes and lyrics in Japanese (not to mention the all-important obi!). The bonus track was nothing special though, just a beat-heavy long version of "Maracatudo". Another oddity about the Japanese insert is that there are no record company logos on it anywhere. Where the US version has the Verve Forecast logo on the front, there's nothing on the Japan version. Same with the back of the insert - no logos at all. The back insert has a small Polydor logo in the light blue left strip where the US version has the copyright text info. There's no UPC bar code on the Japan version. I liked what I heard from Oceano, and it began a tactic that Sergio would employ on his later albums - the alternate language/alternate lead vocal versions of a few of the songs. On this album we're given both "Anos Dourados" and "Años Dorados". The first is a sumptuous duet between Gracinha and Caetano Veloso in Portuguese, while the second is a Spanish solo from Mexican artist Emmanuel. Then there's the two versions of "Puzzle Of Hearts". The first features an English lead from Joe Pizzulo exchanging with Portuguese lead from Gracinha, making for another lovely arrangement. Later on, we're treated to the same song in Italian with the lead by Zucchero. In both of these cases, picking one version that's better than the other is tough, as both are good. My instincts toward the favored traditional "Sergio" sound with Gracinha Leporace singing leads me to those in both cases. There are a couple of of nice, sprightly instrumentals on the album too, and while I like Mike's idea of a great Sergio and Gracinha compilation, doing one of instrumentals could be interesting too. And the second of the instrumentals even has a light vocal scatting by Sergio and Gracinha ("Vale de Ribeira"). I love the feel of this album, and picking just one track as a favorite is hard, but I also like Mike's choice of the lead track, "Rio de Janeiro", so I guess I'll pick that one. I voted for Rio de Janeiro. A favorite song of mine. They would often sing it when they performed live. I have the CD single of Maracatudo. It has a remixed version of the song that I like better than the album version. On playing the CD the first time, I was taken by the opening track. Gracinha's vocal on Anos Dourados is amazing and easily one of my favorites. That said, the idea of a "concept album" is there in full force -- a concept he covered much better on Stillness.